The Bird is, indeed, the word here at Chelsea Doll! We've loved bird jewellery forever and thought it was about time that we compiled a collection in devotion to our feathered friends. The Bird is the Word is not only full of wonderfully kitsch new pieces, but also features a few old favourites. So if you're a fan of bird jewellery, you'll absolutely adore this new funky collection! 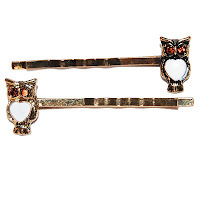 When we saw these Little Owl Hair Slides, £6, we knew straight away that we would have to own a pair. Such an unusual piece, you've heard of bird jewellery but now you can look uber-cool in an owl hair accessory. Unbelievably cute, it'll be love at first sight with these little fellas! This Gold & Brown Patchwork Owl Ring, £9, not only ticks our *obvious* bird-love box but also, with its brown, gold and mustard colours is pretty on-trend with its seventies credentials! 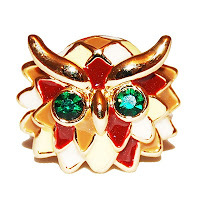 With gorgeous emerald green crystal eyes, this owl ring is super sweet! Aww! The Tweet Tweet Brooch, £12, is a definite fave of the collection. 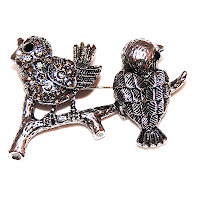 A quirky, cute, antique silver and crystal brooch featuring two birds tweeting together on a branch. A funky addition to any brooch collection! Our personal favourite is the Princess Peacock Necklace, £14. You can see from the vivid colours that this necklace was made to be in the limelight. 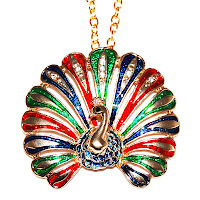 A beautiful peacock design in bright blue, red and green enamel, we can't stop looking at it. If you're looking for a necklace to jazz up an otherwise boring outfit, then this is the one for you!